Just like hard-working machinery, bodies need fuel. To ensure peak performance, employees need fuel that works as hard as they do … with a taste that keeps them revved up for more. 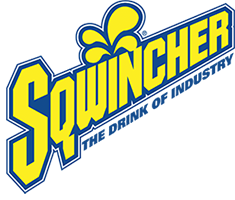 Sqwincher has served industrial workers since 1975. It is the only electrolyte replacement drink specially created for the high heat-stress environment of the workplace. Plant managers, safety directors, plant nurses and industrial hygienists rely on it to protect workers against heat stress and fatigue and shield operations against high disability costs, lost time and lowered productivity.